The Creative Momentum is one of the best ppc companies to work with in regards to setting up and managing your PPC campaigns. We understand Google’s quality score and can help you improve it, which reduces your cost and improves your ROI. 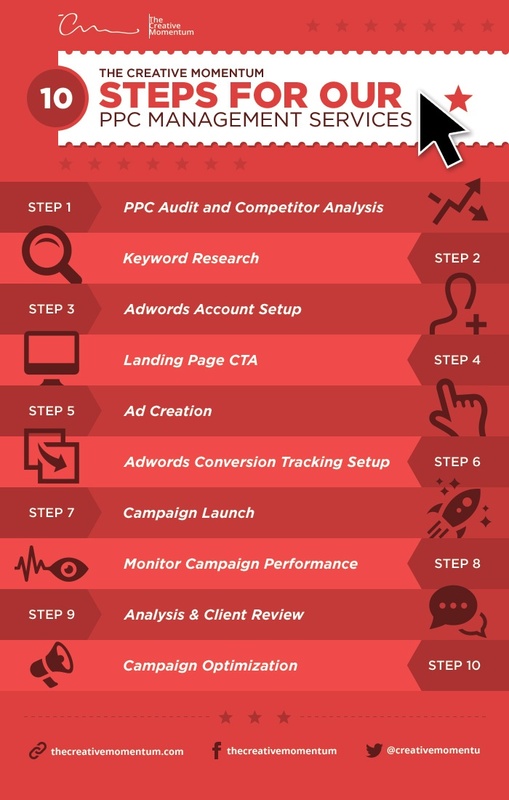 With The Creative Momentum, PPC is easy, collaborative, and can generate an immediate return on your investment. Keyword Research – Keyword research is the heart of your campaign and one of the most important steps. You want the right kind of visitors to your website, not just visitors. The Creative Momentum takes a look at things like sorting and organizing your keywords, keyword difficulty, making sure we are targeting the right keywords, long tail keywords, and adding negative keywords. Adwords Account Setup – Your account structure is like your motherboard for your computer. This is where all of your settings are with regards to your campaign. Google Adwords is constantly changing and making updates. The Creative Momentum has experts that set up your account in the most effective ways. We make sure things like budget are set appropriately, landing pages are setup, ads, locations, etc… Basically everything! Not having a well-structured account is like trying to fly an airplane that is not properly built. But don’t worry, sit back and relax –that’s why our clients hire us! Campaign Launch – Our team reviews your campaign to ensure everything is working, the correct settings are enabled, and the budget is correct. Now that The Creative Momentum and you have put in all the hard work, it’s time to launch and start generating leads and ultimately revenue! Monitor Campaign Performance – The Creative Momentum is constantly reviewing your campaign such as the status, CTR (Click Through rate), Avg. CPC (Cost-per-Click), keyword costs, and the user’s behavior.